Blog Home ❯ Mattress Tips & Tricks ❯ Can You Donate a Used Mattress? We’ll answer your questions about who accepts mattresses for donation & how to donate an old mattress. You’re trading up your old mattress for a brand new one, and you can’t wait to sleep in your new, comfy bed for the first time, but you’re definitely not looking forward to dealing with getting rid of the old one. What are you supposed to do with a used mattress? You’d rather pass it along to someone in need than throw it away and have it end up in a landfill, but you’ve been searching the Internet for hours for where to donate an old mattress and still have zero answers. Trying to find “mattress donation near me” can be so difficult that many people just finally give up on mattress donation and recycling altogether. Luckily, you’ve found this article where we’ll explain the secrets and details of donating a used mattress to charity. Keep reading to find out where to go to get rid of your old mattress by donating it. Do thrift stores take used mattresses? Habitat for Humanity is known for building housing for low-income and disadvantaged families. They furnish these homes with household goods and furniture that are donated by businesses and individuals. These Habitat ReStores accept donations of new and gently used appliances, furniture, building materials, household goods, and other items. Each ReStore is unique, and not every location is able to accept the same items. Donating goods to Habitat For Humanity is a great option for getting rid of unwanted items while helping others in your community, and many Habitat ReStores offer free pickup of large items. Because there are several ReStores not able to accept donated mattresses, due to public health regulations, you’ll need to contact your local ReStore to find out whether you can donate your unwanted mattress to them. 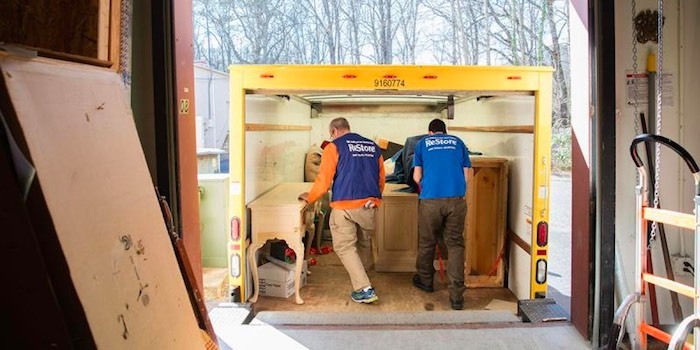 You can find the Habitat ReStore location nearest you and their contact information by entering your ZIP code in the search box on their website. Unfortunately, the Salvation Army does not take mattress donations. Their website explains that while you can’t donate a mattress or box spring to any Salvation Army location, you can donate a bed frame. The Salvation Army may not be equipped to handle mattress donation, but they are a great place to donate other used furniture, electronics, home goods, clothing, and other unwanted items. Last year, the clothing and household items donated to local Goodwill organizations helped 288,000 people across the United States and Canada to become employed. Goodwill’s website states that while they accept most household items and clothing, they cannot accept items that have been recalled, banned, or that don’t meet current safety standards. They also recommend giving your local Goodwill organization a call to learn about any rules or restrictions for donating specialty items such as mattresses, computers, or vehicles. So, while some Goodwill locations may accept your mattress donation, not all are able to. Check the Goodwill locator to find your nearest Goodwill drop-off location and their contact information so you can give them a call and find out if they will accept your used mattress. Some Goodwill locations also offer pickup services for bulk donations. There are also plenty of local charities and nonprofit organizations that may accept your used mattress donation. However, it can be hard to figure out which charities near you accept donated goods. While their website is a little clunky and vague, you may want to try visiting DonationTown as a way to find charities that will take a used mattress where you live. You can find a list of local charities by entering your zip code and searching the DonationTown directory. From there, you can visit the websites of charities and nonprofits near you to find their contact information and if they accept mattress donations. You do have to enter your name and email address to search for charities and the DonationTown website could be a little more user-friendly, but it’s a good start in your search for mattress donation. Where can you donate a used mattress? The first thing to think about when donating a mattress is whether or not you would sleep on it if someone gave it to you. Now, you would think this would be pretty obvious, but apparently, some people don’t get it. Basically, make sure your mattress is in good shape and doesn’t have anything major wrong with it before you decide to donate it. If you also have old box springs you’d like to donate, first check to make sure the cover is firmly attached and that there are no stains, rips, or other damage. That mattress base isn’t going to do anyone any good if there’s something wrong with it. Donating a mattress to charity can be a good way to keep it out of the landfill, but only if that mattress is in good condition. That’s why most charities won’t accept your less-than-desirable mattress or furniture. Please don’t be disrespectful and take advantage of shelters or other charities by giving them a crummy mattress. You may think you’re being eco-friendly, but they’re just going to have to throw your old mattress away when you donate a lemon. If you’re thinking about donating your old mattress, keep in mind that your bed should be in good condition, comfortable, hygienic, and free from bed bugs or anything else that would make someone not want to sleep on it. Finally, if you’re going to donate your mattress, you’ll have to find somewhere to drop it off and figure out how to haul it there. This can be a huge hassle when finding where to donate a used mattress. It’s easier to donate a mattress when you live in a big city with more nonprofit organizations and charities that have the resources and facilities to handle mattress donations. Many of these charities work with people who are in need of a mattress or bed. Donated mattresses and furniture can usually be taken to a furniture bank where people in need can “shop” for a bed. If your mattress isn’t in great condition, you should probably look for mattress disposal instead. You can still have your mattress recycled, it just won’t be reused by someone else in its current state. Thankfully, there’s an easy way to have your old mattress picked up and recycled, whether or not you can donate your used mattress to a nearby charity. Who picks up mattresses for donation? While some charities do offer pickup of donated items like a mattress set or furniture, it can take several weeks before they’re able to get to you since so many people choose to donate their unwanted items. Instead of having to constantly climb over that mattress in the hallway while waiting around for a charity to haul away your mattress donation, you can book a pickup with a green mattress removal company who will make sure your old mattress is donated or recycled instead of hauling it to the dump. Mattress Disposal Plus is a nationwide mattress removal company that will pick up your used mattress, box spring, bed frame, furniture, and other unwanted items then haul them to a local charity for donation or recognized facility for recycling. 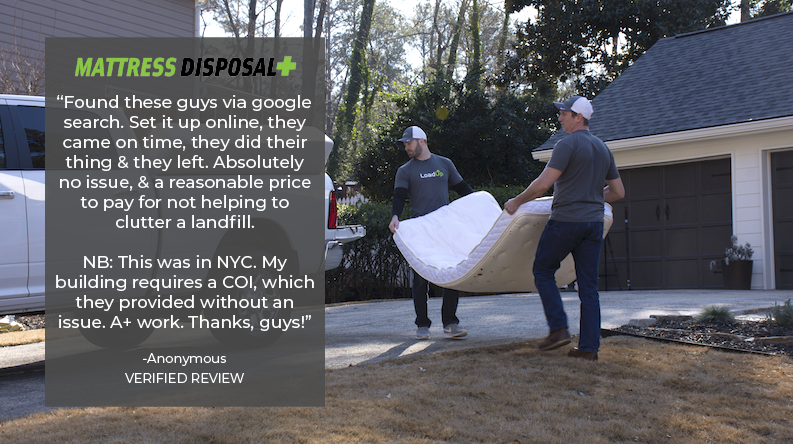 They’re able to charge 20-30% less than most other furniture and mattress removal companies because Mattress Disposal Plus bases their prices on item count instead of volume. 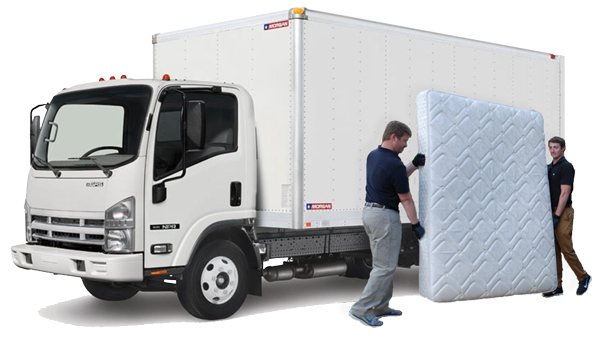 You can completely avoid the hassle and frustration of mattress disposal by calling a professional mattress removal service like Mattress Disposal Plus to haul away and responsibly dispose of your old mattress set for you. Because they give you a low, upfront and honest final price before you book your pickup, you don’t have to worry about experiencing sticker shock when Mattress Disposal Plus arrives to haul away your old mattress or furniture, which is rarely the case with most other mattress removal companies. Whenever you need to get rid of an old mattress, box spring, bed frame, furniture, or just about any other junk you can think of, give Mattress Disposal Plus a call. They will do everything they can think of to make sure your mattress disposal experience is the best thing about your week! Still have questions? Give us a call or chat with us online to learn more about our mattress removal & disposal services and how you can book a pickup with us.